For today’s post we are going to feature some of the deeper content on the Hope Industrial website. Among other things, our Support section includes several pages on industrial ratings, compliances, and certifications as they pertain to our displays and touchscreens. Industrial Display NEMA / IP Ratings Overview – this page outlines what is probably the most important feature of our products to many users: environmental exposure ratings. Our displays and touchscreens are used in almost any conceivable industrial environment from soft-drink syrup plants, to tire manufacturers, to chicken processors. Each of these applications has a NEMA or IP exposure rating that must be met. We rate our products to the NEMA rating system and by translation, the IP rating scheme. It’s important to note that NEMA is a “self-certifying” system. Any manufacturer can simply design a product to the rule and claim compliance without any outside body confirming this fact! Hope Industrial elects to take this a step further – many of our key products are actually sent to Underwriters Laboratories who put our designs through rigorousness testing to ensure that any products we ship meet the demands of each NEMA type rating (see UL 50E below). Not all (in fact, surprisingly few) equipment vendors take this extra step; we have seen many designs cross our benches that don’t come close to meeting their NEMA rating claims. This is most obvious when it comes to keeping water out. Many designs in the market that claim a full NEMA 4X rating (basically meaning safe for full hose-down environments) could only be called “splash proof” at best. This webpage discusses both the NEMA and IP ratings that apply to our displays and touchscreens. For those that are not used to working with these ratings, the page even provides a simple checklist to help determine the appropriate rating for any given environment. UL Certifications – Underwriters Laboratories also certifies our products to a variety of safety standards. This page discusses the UL 60950 (3rd Ed.) category that covers most of our equipment, as well as the UL 508 category that covers all of our Panel Mount monitors and touchscreens. Specific information regarding the UL 50E certification mentioned above is also provided. For each of these categories, this page provides links to the UL page containing our certification documents. IEC Reliability Standards for Industrial Monitors and Touchscreens – NEMA/IP ratings do a good job of matching our products to any given industrial environment, and UL50E certifications back up these claims. 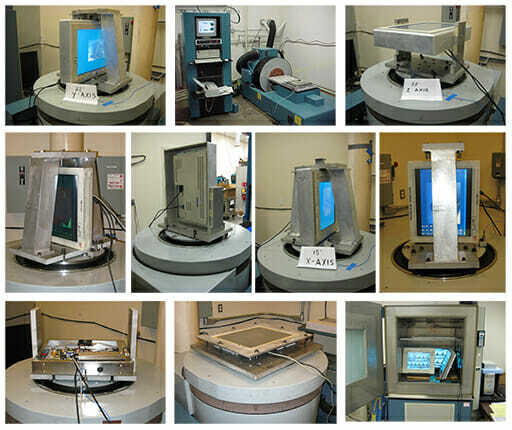 But this page covers yet another set of tests our monitors and touchscreens undergo: IEC 60721-4. This certification is used to determine and test our products for suitability in the types of environments they will be transported, stored, and of course, operated. 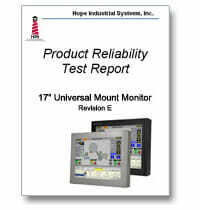 Here you will find links to full test result reports for many of our products. Test results include heat and humidity, water, shock, vibration, falling and much more. Hazardous Location Industrial Touchscreens and Displays – Some of our products are also rated for use in hazardous environments. This includes 17″ and 19″ versions of our Panel Mount touchscreens and displays, as well as the comparable Universal Mount models. 17″ and 19″ Rack Mount displays are also approved. Several of our industrial keyboard models and industrial KVM extenders have also been rated for hazardous locations when used with one of our Universal Mount Monitors. This means an entire HazLoc workstation can be configured along with a KVM extender. The Panel Mount and Universal Mount displays and touchscreens, keyboards, and KVM extenders are rated to Class I, II, & III, Division 2, while the Rack Mount displays and touchscreens are rated to Class I, Division 2. Here you will also find links to the corresponding proof of compliance on the UL website. The ratings themselves are also explained. Environmental Compliances (REACH / WEEE / CE / RoHS) – Finally, we have published compliance information for those markets which are subject to REACH, WEEE, CE, and RoHS regulation.